While there have been numerous reports during the past year claiming Samsung was readying its own smartphone line-up using the Tizen operating system, the South Korean company hadn't made any official announcements. On Thursday, Samsung revealed in a statement to Bloomberg that 2013 would indeed be the year that open-source OS phones would arrive. "We plan to release new, competitive Tizen devices within this year and will keep expanding the lineup depending on market conditions," Samsung stated. The news comes just days after the Daily Yomiuri reported that anonymous sources claimed Samsung would unveil the first Tizen phone in Japan through NTT Docomo. Samsung still hasn't even shown off a proper model of a Tizen smartphone, so it comes as no surprise the company didn't reveal an exact date or even a time frame for releases. Though Samsung has seen some incredible success in 2012 running Google's Android OS on phones like the Galaxy S3, the company is clearly looking to become a bit more self-reliant in 2013. Samsung sold 55 million smartphones during the third quarter of 2012, leading all its competitors like Apple and Nokia by a wide margin. 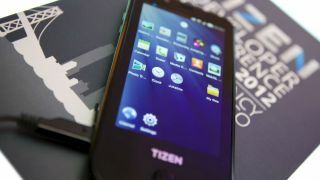 Tizen will be faced with plenty of challenges in the coming year, particularly considering Android dominated the market with a 72.4 percent stake. While it's true Samsung was the number one selling Android device maker, there's no telling if consumers will follow the manufacturer when it strikes off on its own. Even if Samsung contributed to a large portion of that number, there are no guarantees the new OS will be able to make waves amongst the likes of iOS, Windows Phone 8, and BlackBerry 10, each of which is vying for a much smaller piece of the pie.